The bed was fabulous. Sorry I had to climb out and go to my conference! We were upgraded upon check-in to a harbour view apartment.The room was fantastic, great kitchen, plenty of room. Service was great and staff were all very friendly and happy. Location is perfect,within walking distance to entertainment,food,pubs,ferry port. All in all, a great stay! The property is spacious, well-equipped and exceptionally well-located, just across Manly Wharf.Traveling to the city was super-easy and fun (bye, bye, Sydney traffic!) and hello, warm sea and sand after work. The staff was friendly and efficient. Everything was taken care of well ahead of time. We all had a very good time, thank you. Excellent check in staff. Well equipped room. It had everything you could need. Kitchen, laundry, space. We were upgraded which was unexpected and lovely. The gentleman who greeted us upon arrival at reception was a real credit to Quest Hotels. He made out check in process so smooth. Wonderful place! Very friendly and helpful staff, perfect apartment over looking the wharf and although it's opposite the bus stop very quiet. The bed was divine!! Ideally located for shops and restaurants with a taxi rank just outside. Nice balcony to sit and watch the coming and goings in Manly. Perfect. The room was great, very comfortable and clean. It was also serviced daily which was unexpected. We very much like the location , near to transport (ferry) and the Corso. Lock in a great price for Quest Manly – rated 9.1 by recent guests! Quest Manly This rating is a reflection of how the property compares to the industry standard when it comes to price, facilities and services available. It's based on a self-evaluation by the property. Use this rating to help choose your stay! The property offers an array of accommodations options including studio, 1 and 2-bedroom self-contained serviced apartments. Most include breathtaking views of Manly’s harbor. Guest facilities include a fitness center and sauna. There is also a restaurant charge back facility for selected restaurants close to the property. With restaurants and shops at your doorstep, Quest Manly Accommodations is a short stroll from the world-renowned Manly Surf Beach. Nearby Manly attractions include Manly 'Surf n Slide' Water Park, Q-Station and North Head Sanctuary. When would you like to stay at Quest Manly? This spacious apartment offers a balcony with district views, a kitchenette and laundry facilities. It offers broadband access and cable TV. Featuring extra space and sweeping harbor views, this apartment has a balcony and a full kitchen. It has laundry facilities, 2 TVs with cable channels and broadband access. Quest Manly is the ideal base for your stay in Manly. 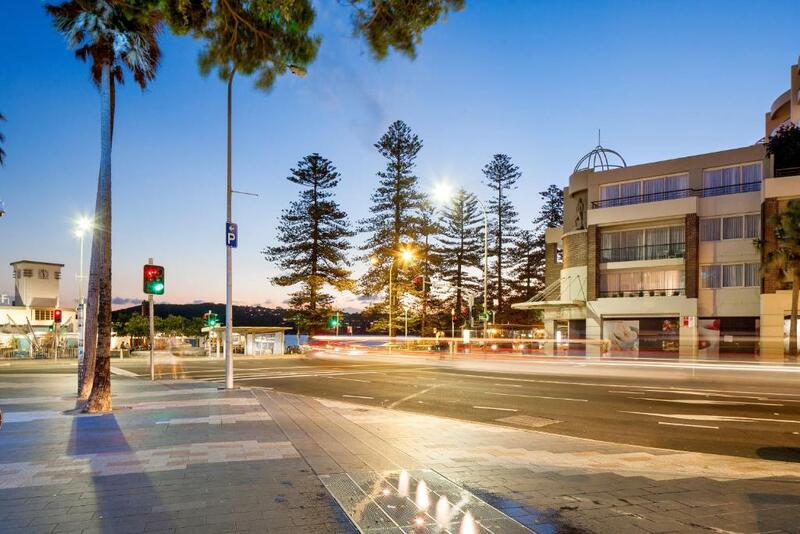 Splendidly located right in the middle of everything that makes Manly great; from the beach, to restaurants, bars, cafes and shopping- everything Manly has to offer is all literally on our doorstep. Manly Wharf is just across the road making commuting to Sydney’s CBD as easy as kicking back on the Ferry. The property itself has a majority of studio and one bedroom apartments with the latter all boasting magnificent views over Manly Cove. All rooms come complete with kitchen or kitchenette, laundry facilities, balconies and complimentary Wi-Fi internet, Foxtel iQ2 and luxury Biology toiletries. All guests also have complimentary access to our recently refurbished gym and sauna. Secure parking in our undercover carpark is available by request for 25 AUD per night, per vehicle. Our friendly staff love nothing more than ensuring all of our guests get the most out of their time in Manly. We look forward to meeting you. Manly is a vibrant, close knit community filled with all sorts of destinations to fill your days with whatever activity you are after. You can literally walk to at least 5 different beaches within 10 minutes (beaches on the harbour side are perfect for kids as there is no waves or swells), hire a kayak, go parasailing, eat at world class restaurants, sip a fine cup of coffee from artisan baristas scattered about or have a drink at a variety of cool but laid back bars. You can head up to North Head for a spot of history and bushwalking, take the kids to the aquarium, learn to surf or just grab a book and get comfy on Manly Beach. We haven't mentioned shopping yet, but if that's your ticket there is a thriving retail precinct two minutes walk away. Manly is as safe as any modern cosmopolitan area anywhere in the world. Come and visit us and see why all of us at Quest Manly are so proud of our local environment- we are sure you will love just as much as we do. House Rules Quest Manly takes special requests – add in the next step! Free! All children under 16 years stay free of charge in a crib. Quest Manly accepts these cards and reserves the right to temporarily hold an amount prior to arrival. The bath was quite small and shallow. shower rails are needed. removable shower rose also. Noisy due to restaurants below and next to set of main lights. The hotel is directly opposite a main bus stop and is very noisy during peak hours. The diesel fumes prevent you from using the balcony and enjoying the view from your room during those times. I thought the room was very comfortable and the outlook great. The system for parking. We had to ring the desk frequently to open boom gates. Would have preferred an electronic card linked to our room and time of stay. I could not extend the checkout for an hour. Everything was great. The room was spacious, comfy bed and great view of the corso. Have stayed here before so this is our second time and will definitely be back again.